If you’d like to get more enjoyment out of your outdoor space in Hilton Head, South Carolina, turn to the outdoor living experts at Porch Outfitters to learn about our patio room systems. Also known as sunrooms, these structures allow you to bring the outdoors in. You’ll be able to enjoy the beauty of your outdoor space without having to deal with oppressive heat, pesky insects, and inclement weather. To ensure our customers receive an incredible value for their investment in a patio room, we offer products from TEMO – one of the most respected manufacturers in the industry. TEMO sunrooms are built with beauty and performance in mind. For example, they are available in numerous styles including studio, solarium, cathedral, and others to suit your unique needs and your home’s architectural design. They also feature premium thermal roof and glass systems, which make them exceptionally energy efficient. And, our patio rooms are constructed of extruded aluminum with TEMKOR surfacing, which makes them incredibly durable and resistant to scratching, denting, and other forms of damage. To ensure your patio room is flawlessly installed, Porch Outfitters will only use our own team of experienced professionals – not subcontractors – to complete the project. We’re so confident in the skill of our installers, that we’ll even back our labor with a lifetime warranty. 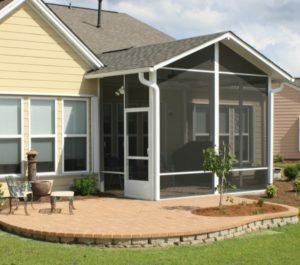 Learn more about the benefits of having Porch Outfitters install a patio room on your Hilton Head, SC, property by contacting us today.